Engraved for Murrays History of the American War. / General Washington. / Printed for T. Robson, Newcastle, upon Tyne. Version I: As shown. Collections: Boglewood Collection; Library of Congress. 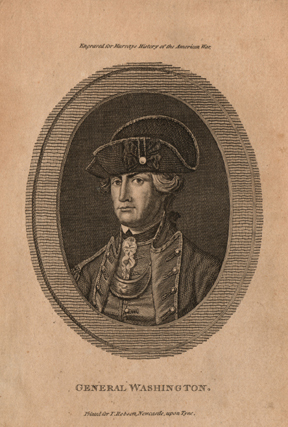 Published in: James Murray, An Impartial History of the Present War in America Containing an Account of its Rise and Progress, the Political Springs thereof, with its various Successes and Disappointments, on Both Sides (Newcastle upon Tyne, 1782), v. 1, p. 239. © 2012 Boglewood Company/C. I. G.